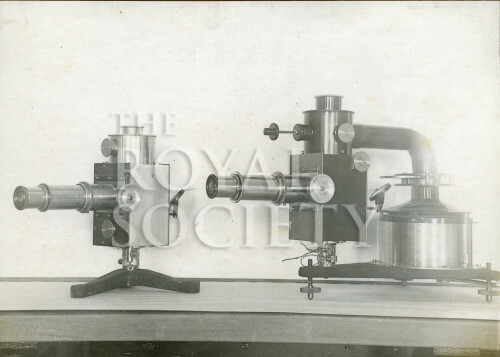 Two instruments, captioned ‘Separate Electrometer & Ebert’s Apparatus (for comparison of parts)’. A text accompanying the illustration states that the first instrument is for: ‘the measurement of the variations of Electric potential….An isolated pipe leading from an insulated tank juts out at a certain distance from the wall into the open air….from the end of this pipe through a very small hole water is continuously spraying. The spray takes up the Electrical potential and communicates it through a wire to a quadrant electrometer…’ The Ebert apparatus was for measuring the ionisation of the air: ‘A definite amount of air is sucked through a tube by a circular fan. The free electrons…are collected by an electrified rod in the tube which attracts them. Thus the electrons give up their charge to the rod which conveys it by means of a wire to…an electrometer’.